Did you know there are 16 searchable heating types for listings in NorthstarMLS Matrix? If you have a client looking for a specific type of heating, you can run a search in Matrix and provide a quick answer. To find heating types, add Heating to your search from the Additional Fields. Scroll through the list to see the available heat types and click to select a heating type for your search. The most common type is forced air. 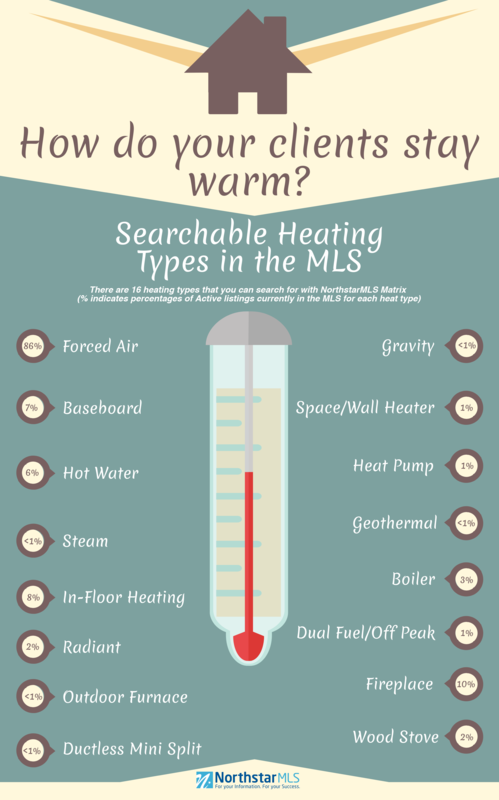 Our infographic shows each type of heating and the percentage of homes currently listed in the MLS that have it. I don’t see solar heat on the list of heat sources. I have a client with passive solar heat for the second floor of the house and regular solar panels to supplement the electric. Is there a place for these to be listed? This is great information and a good searchable field, however, does everyone know the difference between these types so we are all on the same page? So when I search for in-floor I don’t get radiant or boiler? Is there a source for the definitions between these types? Thanks for checking out the article and infographic for heat types. Unfortunately, we do not have a heat type definitions list currently.